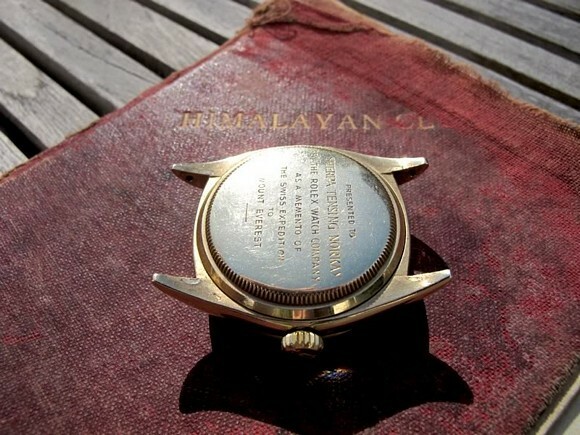 THE Tenzing Norgay Rolex, one of the most important historical Everest Rolex ever, has been discovered! So let’s start my journey where we ended last time, when I came in contact with the Tenzings who asked me to examine their father’s Rolex…. The more I got closer, the more excited I became. Especially when I held it the first time and saw the caseback!!.. 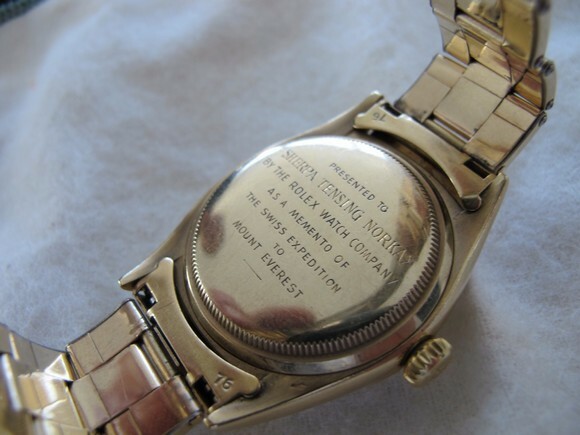 “Presented by the Rolex Watch Company as a memento of the Swiss expedition to Mount Everest” it says! 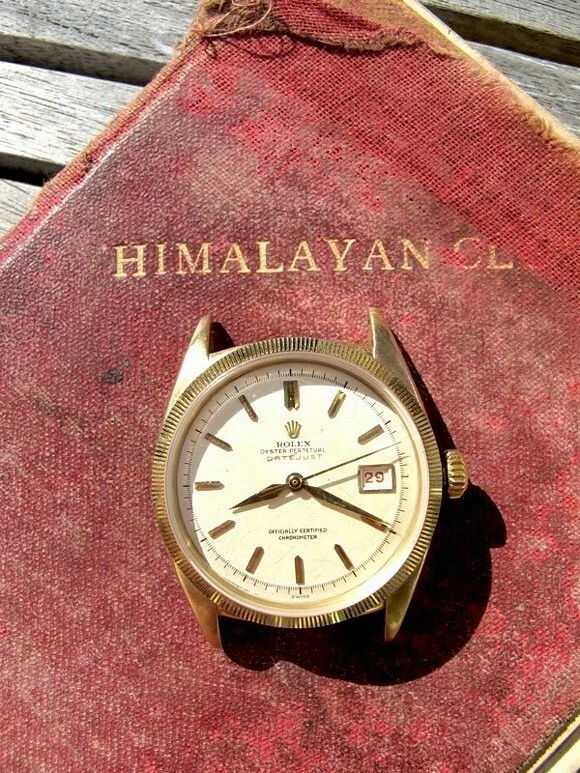 An “official” gift from Rolex to Sherpa Tensing Norkay, for his achievements during the Swiss 1952 Expedition. Now I tell you that I’ve spoken with the lovely widow of Raymond Lambert and interesting detail was that she shared with me that her husband never gave ‘his’ or ‘a’ Rolex to his friend Tenzing as rumoured until now. It was “The Rolex Company” that gave it to Tenzing it says! not Lambert, where Tenzing always in Lambert’s house during his stay in Switzerland….. While meeting the Tenzings in the US, the first look at THE Everest Rolex pur sang was a BIG surprise especially to see it was a DATEJUST? !….LOL, after a while I realized: a Datejust on Top of the World! Haha 🙂 !! 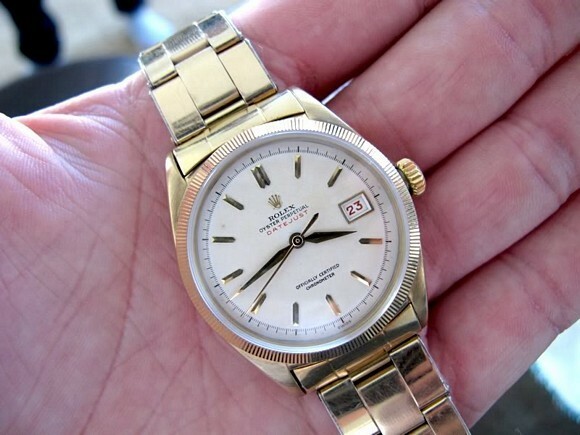 A GOLDEN DATEJUST!!!!!!!!!!!!!!!…. WITH RED writing & Date-wheel!!!!!!!!!! Glorious moment for me personally, also hearing the stories from the Tenzings in how it was kept, were very usefull in the my research! Many thanks to the humble Tenzing family in willing to sharing it with me in the Hillary & Tenzing project!! # Firstly, during my talk it was clear to me that Raymond Lambert had a special relationship with Rolex back in those days. For Rolex not only the ’52 Genevan climbteam should conquer Mt.Everest but Rolex should be worn during any attempt! 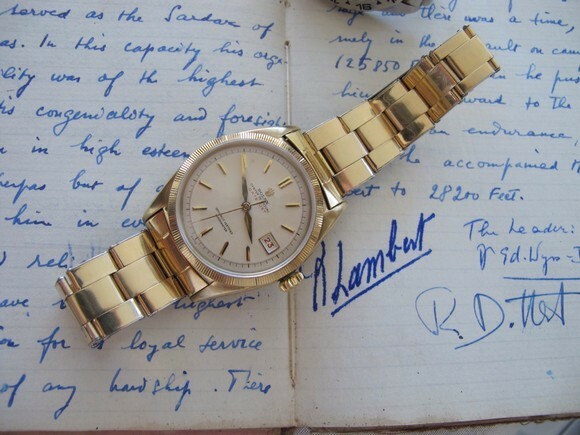 The close relationship Raymond had with Rolex was of deep respect. It was Raymond, continued the keen widow to me, who convinced Tenzing to join the British ’53 Everest Team. John Hunt came with a message from the young UK Queen in spe to Raymond in asking him to convince Tenzing to join! A VERY interesting note she remembered during this proces was that Tenzings wife back then advised him not to take his Rolex to this 1953 Expedition. So again, after Lambert convinced Tenzing to join the British, he now had to make sure Tenzing was wearing a Rolex. I asked her why her husband was so pertinent… She explained to me that Raymond was in full believe Rolex, as genevan based, deserved it to be worn on top of a succesful ascent! In honor of his friendship Tenzing decided to please Lambert, and did not take the “schmutz” she continued! 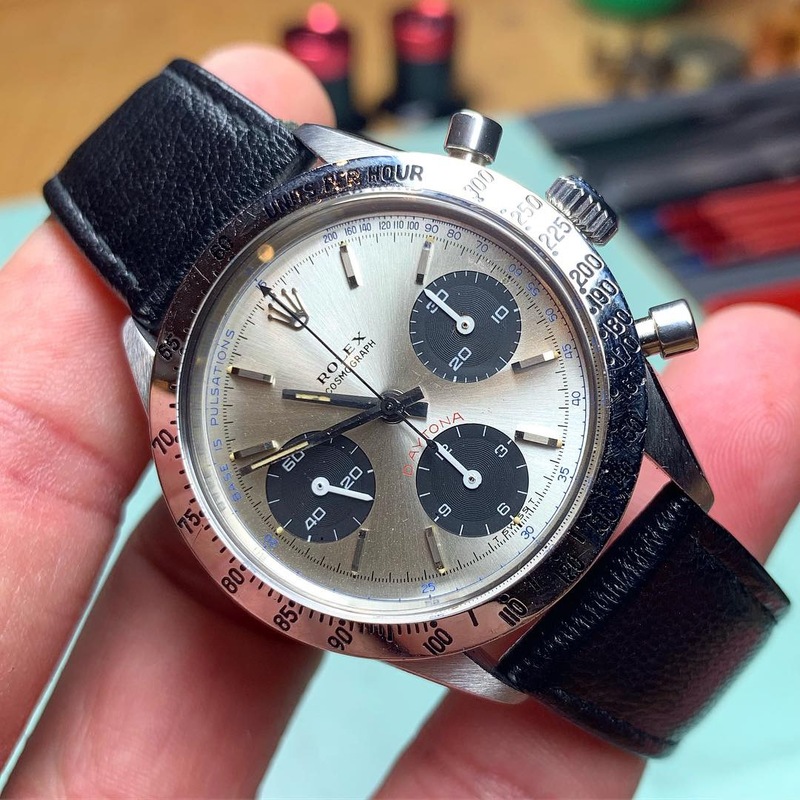 # Secondly, I want to mention that after Yves Lambert showed me his fathers Rolex, he made a very important, but also logic remark. He told me that ALL Rolex watches had to be given back to Geneva for research….as they were prototypes! (Invoice Rolex to British Mt.Everest Expeditions says “with extra long leather strap”) He continued to tell me that the one he’s having, is engraved with his fathers name and given to him AFTER the ascent. All original Rolex watches worn during Everest Expeditions were send back to Geneva. That is what he saw during a visit to the Genevan factory in their private showcase. Having said above, rest us to analyse the shown golden Tenzing Rolex caseback. 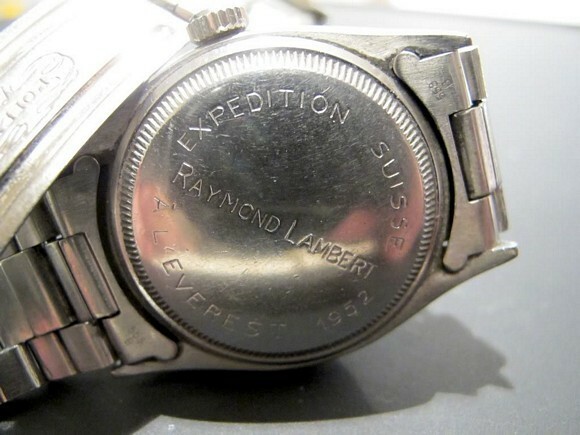 It says: “a memento of the Swiss expedition to Mount Everest”. A brave gravure honouring a exceptional explorer for his effort in 1952…. This rare & important Tenzing Rolex shows a gravure that doesn’t mention the succesful 1953 ascent, no instead it meantions a Swiss ’52 expedition. Tenzing was in ’53 not on paper a member of ’53 expedition, so no steel Rolex on extra long bracelet. 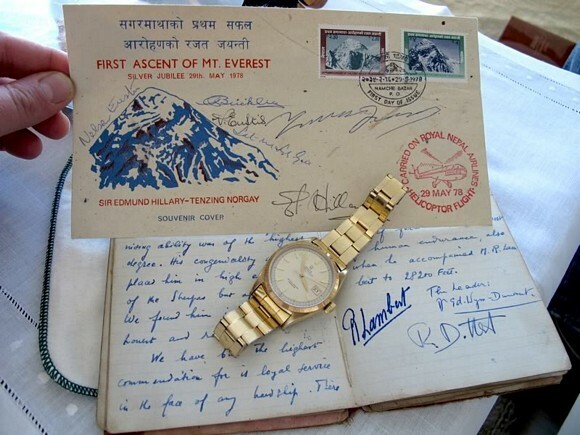 Tenzings own words to his family where that he worn this Rolex on the Mt.Everest. & Again I like to thank every friend involved around me in getting me to see this Rolex grail, I owe you big time for your patience and advise!! Glad to hear so many close Rolex friends are doing their effort to come 19 march to Maastricht, respect! will be fun for sure to ‘update all new grails that hit Passion members in a high frequence lately! 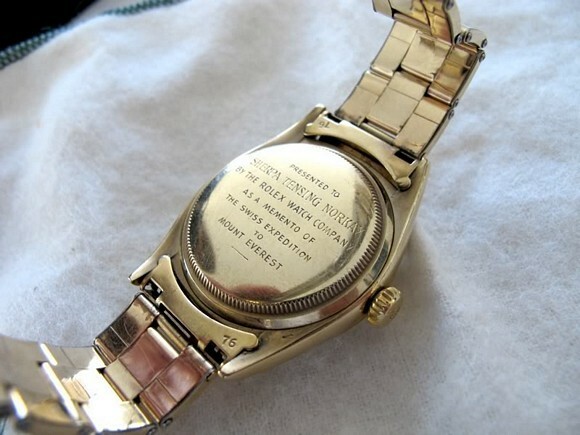 The HTE website (www.hillarytenzingedition.com) shows you more pictures of the Tenzing Rolex! and the both the Rolex of one of last living 1953 British Expedition Members; George Band & more impressions with our encounter with Jane Morris (’53 Times journalist that got the story right on time in London on the day the world looked to the coronation of the young Queen Elizabeth). This post was written by Philipp on March 31, 2011.